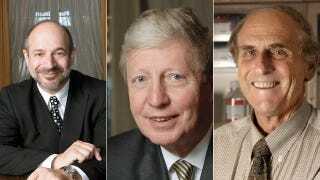 Earlier today, the 2011 Nobel Prize in Physiology or Medicine was awarded to Bruce A. Beutler and Jules A. Hoffmann (pictured left and center, respectively) "for their discoveries concerning the activation of innate immunity;" and to Ralph M. Steinman "for his discovery of the dendritic cell and its role in adaptive immunity." Steinman, who passed away on Friday after an extended bout with pancreatic cancer, becomes the first person to ever be awarded a Nobel Prize in Physiology or Medicine posthumously. It bears mentioning that Steinman — who, like Beutler & Hoffman, was recognized for his contributions to the field of immunology — was actually diagnosed with pancreatic cancer years ago, but extended his life by using a dendritic-cell based immunotherapy (you know, that thing he was considered Nobel-worthy for in the first place) of his own design. The announcement was first issued early this morning by the Nobel Foundation, which was, at the time, unaware of Steinman's recent passing. Since 1974, the statutes of the Nobel Foundation have indicated that "work produced by a person since deceased shall not be considered for an award. If, however, a prizewinner dies before he has received the prize, then the prize may be presented." The thing is, the Nobel Assembly decided to honor Steinman with a Nobel Prize after he passed away; they just weren't aware of it at the time. This put the Assembly in a situation that they have since described as "unprecedented in the history of the Nobel Prize." Discussions over whether or not to award the prize to Steinman posthumously were held just a few hours ago. Fortunately, the Assembly had the good sense to stick with this morning's announcement, and have since issued a statement confirming that their initial decision will remain unchanged.